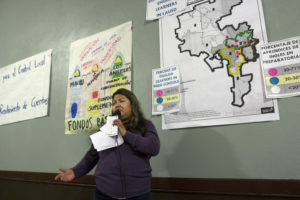 The parent and educational justice advocate voiced her concerns of the shortcomings eastside community schools have endured over the years at a town hall meeting last week held at InnerCity Struggle, a community organization that advocates for educational equality. The meeting was designed to educate parents on how the Local Control Funding Formula works, legislature passed by the California State Senate in 2012. The historic legislation shifts spending priorities from Sacramento lawmakers to school districts and requires input from parents and community advocates and organizations like ICS on how educational funds are to be spent. The LCFF promises to provide more resources for economically disadvantaged students, English Learners and foster youth. For ICS, who represents the eastside communities of Boyle Heights, Lincoln Heights, El Sereno and unincorporated areas of East L.A, it’s an opportunity to give authority to students and parents on where the biggest impact can be made. 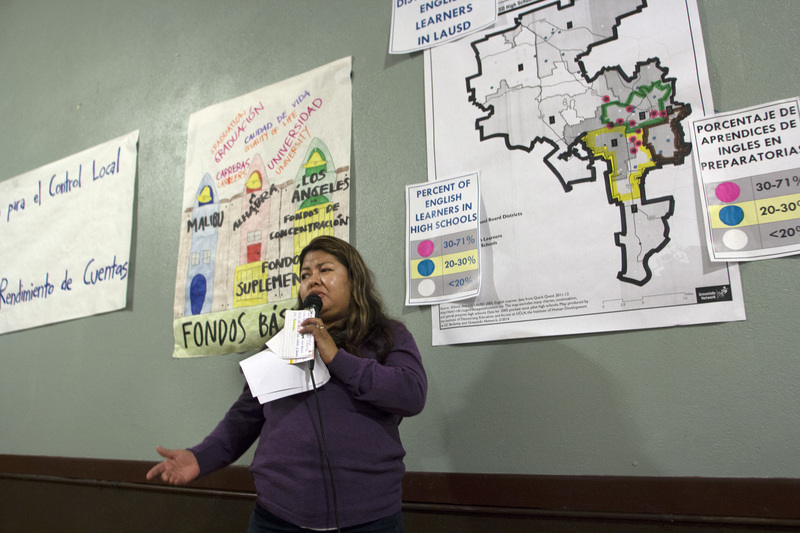 “LCFF is about making sure schools that serve the neediest students get the resources they need to close the achievement and opportunity gaps that exist in neighborhoods,” said Maria Brenes, executive director of InnerCity Struggle. Maria Ruiz speaks to a crowd of over 100 people. Students in attendance at the town hall also voiced some of the struggles they have endured at local schools and gave their opinions on how money should be spent. Esteban Torres High School senior Stephanie Orea spoke of her science classes where students could not conduct experiments because of a lack of resources. “I’m here because I want students who come after me to have it better than I did,” said Orea. Eduardo Pacheco, a Woodrow Wilson High School junior, said he sometimes goes home hungry rather than eating lunch at the school cafeteria because the poor quality of the food. “The food is usually cold and they serve the same thing over and over again,” said Pacheco. During the next four months, the Los Angeles Unified School District will make hard decisions on how to best spend these funds. To ensure that those funds are allocated to schools that have the greatest need, the Community for Los Angeles Student Success (CLASS) organization, a network of over 40 community partners advocating for improvements within LAUSD, is actively seeking community input. Some of the priorities identified by the group include local control of funding, strong community engagement, programs and services for English Learners and their families, and equitable distribution. School climate funding promises to provide a safe environment for eastside students to learn, while wrap-around services, such as mental health and educational counseling, community schooling and tutoring are of great concern. Other issues addressed by CLASS are the high dropout rates for Latino and black students, student suspensions, low graduation rates and poor academic performance.